This khukuri is a very famous knife among tourists and collectors because of the fact that it was actually used by Gurkha soldiers/army during world wars. It is the exact replica that was used in the world war era. This khukuri/kukri knife played a very significant role in creating the history and therefore the name "Historic". This is the old Army model. The documented source and collections say that all khukuris/kukris initially used were made in world war version. 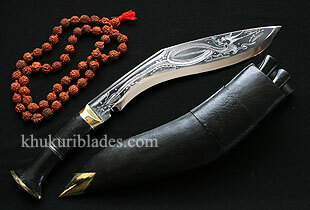 It is believed to have the original shape and size of a khukuri/kukri. This knife is slightly larger and more curved than the current khukuri/kukri issued to Gurkha soldiers/Gurkhas. This famous kukri is carved by hand using only domestic tools by dragons on both side of the blade. This makes this kukri more beautiful with its history and with its new look. Due to scarcity of buffalo horn handle, the blade will now have wood handle.